BombayJules: Our forthcoming Ambassador car rally! Only three more sleeps before Mr Jules and I depart for our holiday. 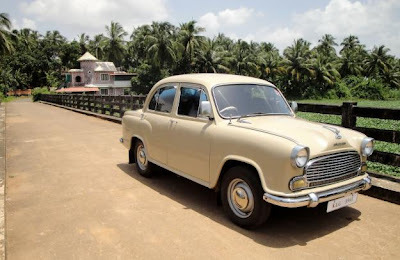 A rally tour of Kerala in an Ambassador classic car! I am so excited I had to write something about it now. I am also thrilled that we will finally get out of Mumbai to explore other parts of the country. Goa is lovely but it doesn't really count as far as 'proper' travelling goes and I have heard that Kerala is soooo beautiful. So what's with the old car? To give you some background, the Ambassador (affectionately known as the "Amby") is a car manufactured by Hindustan Motors of India. Based on the Morris Oxford III model, first made by the Morris Motors at Cowley, Oxford (in the UK) in the late 1950s, it has been in production in India since 1958 with only a few modifications and updating (such as air conditioning). Despite its British origins, the Ambassador is considered the definitive Indian car. In Mumbai, it is mostly politicians who are transported around in these cars but in other parts of India, such as Calcutta (near the Ambassador plant) they are ubiquitous and are commonly the preferred model of taxi. Indians do not hold the same fascination with Ambassadors that us Brits do. They are considered too old fashioned - the locals would rather been seen in something zingy, shiny and new. I've actually just seen this one advertised for sale....tempted! 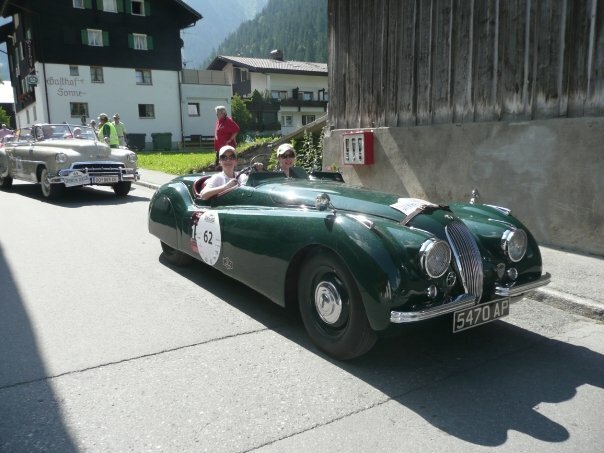 Annette driving and me navigating in her fabulous 1949 Jaguar XK120 (aka "Dorothy"). No roof, no windscreen and no seat belts! And the rally itself? The rally is a two week organised tour of Kerala. It starts in Calicut, then heads off towards the beautiful fort city of Cochin, then passes through Keralan backwaters, stopping off at a lakeside hotel in Kumarakom , then pootles up to the British Hill station 'Ooty', driving on to Mysore "the City of Palaces", then on to the old British summer resort of Munnar via Tea and Sandalwood plantations and finally on to the Wayanad wild life reserve (where we should see elephants! )...then ending back at Calicut on the last day. The cars, breakdown support (probably much needed! ), insurance, hotels and food are all arranged for us by the organisers. There are 40 participants in 20 Ambassador cars (mostly from the UK but on the list are also couples from Australia and Canada and another expat from Mumbai). Those foreigners who have never experienced Indian traffic before are going to have the shock of their lives! - at least Mr Jules and I are used to it although we have never driven ourselves in India. Hopefully we will be able to dodge oncoming traffic/straying animals for two whole weeks, try not to damage our Amby and get home in one piece. We fly to Calicut from Mumbai on Friday and I am hoping to update my blog at stages throughout the 14 days but I am not sure what wifi access will be like..so you might only hear from me in a couple of weeks time! (although I might manage another un-related blog before we depart). Wish Mr Jules luck...he will be the one driving! The Amby rally sounds fabulous. I love Kerala and am itching to go again to explore places like Munnar and Wayanad. My only trip to the state covered Cochin, a bit of Alleppey, Trivandrum, Kannur and Thrissur. Did pass Calicut too. The Fort Kochi area is spectacular. If you have time in Calicut, ask for Paragon - a restaurant that serves delicious appam-stew. Have the egg masala dish. And don't forget to pick up yummy banana chips. Brill thanks for that recommendation J am definitely going to try that! There's not so much written about Calicut and we get there a day early before the rest of the participants - so we will definitely go there! Thanks again! Hi J - we went to paragon it was awesome. Unfortunately I couldn't remember what you recommended so we went for the 90 rupee set lunch - wow delicious!! Thanks again for telling us about this place.